The City of Miskolc is organizing another rapid match for the best Hungarian player, Peter Leko. The City of Miskolc continues its fine tradition of organizing strong rapid matches for the best Hungarian player, Peter Leko. Two years ago we saw a fantastic battle between Leko and Michael Adams. The English player took an early 3-0 lead, but Leko was capable to strike back and even the match to 4-4. Last year’s match Peter Leko – Anatoly Karpov was less exciting as seven games ended in a fighting draws and Leko won 4.5-3.5. This time Leko’s opponent is none else than the World Champion Vladimir Kramnik. The two giants already have a long history, having played against each other more than 70 games and two matches. Kramnik won the first rapid match in Budapest 2001 with a score 7-5. The second meeting was the battle for the Classical World Chess Championship in Brissago, Switzerland. Leko was leading through the 2nd half of the match, but Kramnik managed to win the last game and tie the match 7-7, thus keeping the title as defending champion. Peter Leko is the current Rapid World Cup Champion after he took the 1st ACP World Rapid Cup staged on January 4th-8th in Odessa, Ukraine. 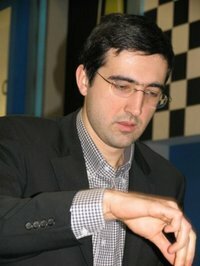 Vladimir Kramnik, who is considered to be extremely dangerous in rapid chess, skipped the ACP Cup, but won against Peter Leko in the Melodi Amber tournament held two months after the Odessa. Therefore, the cards are open and the result is unpredictable, it will be fun to watch.